TapKick – Dominic Rödel – Interaction Designer. Can you make an iPad game in two weeks? TapKick – A local multiplayer soccer game. 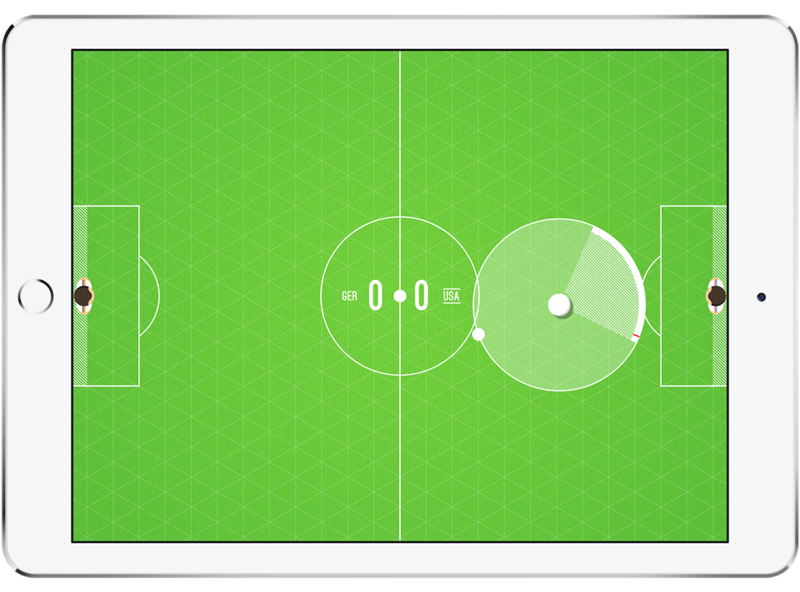 TapKick is a round-based local multiplayer soccer game for the iPad. Just place your iPad on the table, gather your friends and get into "one on one" duels. Choose from 32 different teams participating in the final round of the Worldcup in Brazil and lead your team to victory! Is it possible to translate the physical tabletop game “Tipp-Kick” to an application that is as enjoyable as the real version? The physical game features small figures of players with a flexible shooting leg. Tapping a big button on the head of the figure makes the figure kick a dice-like “ball”. The ball showing black or what color on top after the kick indicates whose turn it is next. The goalkeeper – being attached to as stick – can move freely left and right as well as up and down to keep his goal clean. As a physical game and getting most of its joy out of the fine nuances of physics, we realized it is hard to translate physical behavior one to one to an application. Instead we approached the game in a different way by using what we thought would be the digital equivalent to real world physics when using physical figures in three dimensions: Touch gestures on a two dimensional surface. Intensity: Defining how hard the ball is shot and how fast it is moving. Direction: Defining the direction the ball is shot at. Curvature: Defining how much and in which direction the ball is diverging. We wanted to keep the minimal interactions of the physical game and translate it to the digital version. By simply placing the finger on the ball and dragging it the user adjusts the intensity of the shot. Moving left and right around the ball simultaneously is modifying the direction. The curvature is handled by a time based action. A small indicator is moving left and right within the spreading area of a shot that is increasing the harder the shot is being performed. Lifting the finger up shoots the ball in the desired direction with the curvature indicated at the time of shooting. This way we managed get a nice mix of skill and luck. Placed on a table the controls work from everywhere around the device. Getting into the App Store is not as easy as we thought. Legal work is not a huge deal – it is just taking time. Considering we gave ourselves a deadline of two weeks we had to get through these steps quite quick. Getting a DUNS Number for example was a little more time consuming than initially thought. On the creation level we were quite surprised what could be done in just two weeks – from idea to submitting. The game-mechanics worked good and the design was received quite well when we tested the game with our friends – in the half time break of the world cup games. Since a proper usertesting didn't feel like the right thing to do we were just aiming for real world gut feeling feedback. As honest as friends can be. TapKick turned out to not only be a fun project to work on for a short period of time but a fun way to pass some time with friends. In the end we managed to get TapKick on the AppStore in around three weeks from start to finish including all the paperwork that needed to be done. Overall it was a fun experience – building it and playing it in the halftime breaks of the Worldcup matches.